If the first few weeks are any indication of what where going to see in the WLA this season, we are in store for one heck of a season. With so much parity throughout the league this year, its really hard to predicit where teams may fall once the regular season has concluded. Victoria has added a number of big name players, as their back to back losses to the Six Nations Chiefs in the Mann Cup finals has left a bitter taste in their mouth. Maple Ridge has made big strides forward, challenging the Shamrocks for the WLA crown a year ago. New Westminster has put together a solid young roster, that it back stopped by two of the top young goaltenders in the game today. Langley has also beefed up their lineup some with some Ontario born talent, as Pat Saunders will look to replicate some of the success he had the last time he dawned a Thunder Jersey. Nanaimo and Burnaby will be competitive, and will undoubtedly challenge for a playoff spot in 2015, while the once proud Coquitlam Adanacs look to have fallen on some hard times of sorts. The positive ? The Shamrocks have won back to back WLA titles. The negative, they’ve been defeated by the Six Nations Chiefs on back to back occasions in the Mann Cup final. With the additions the Shamrocks have made to their lineup for the 2015 season, it’s very clear Victoria is all in this season. In goal the Shamrocks have added arguably the best goaltender in lacrosse today in Aaron Bold. Bold is coming off an NLL regular season where he led the league in Wins and Goals Against Average, while also sitting in the top 3 in Save Percentage. Defensively the Shamrocks look to be an athletic, physical bunch that will be able to transition the ball well and able help the team some offensively. Defensively the return of Rory Smith from MSL will help a ton on the Shamrocks back end, as Smith will not only bring grit and physicality, but he has also quickly developed into one of the better all around defenders in the pro game. Ethan Garland and Ben McCullough are really underrated defenders who both will play integral roles on the Shamrocks back end. While the return of the Harnett brothers, Bradley Kri, Tyler Burton and Ryan Dilks allow the Shamrocks to form arguably the deepest and most talented defense in the league. Karsen Leung had a break out season with the Calgary Roughnecks this season, an undoubtedly will be expected to produce for the Shamrocks this season. Offensively the Shamrocks added Dan Dawson from the Brampton Excelsiors, as well as Daryl Veltman through an off season trade with the Coquitlam Adanacs. Rhys Duch, Cory Conway, Jesse King, Scott Ranger and Corey Small also all return to the Shamrocks this season. Victoria is the deepest team in the WLA this season and with the combination of an elite goaltender, a potent offense an stingy defense the Shamrocks should be hard to beat moving forward. Maple Ridge will look to take one step further this season, as they where defeated by the Victoria Shamrocks in the WLA final last season. While that task may have gotten harder with the additions the Shamrocks have made and the loss of Curtis Dickson to the Peterborough Lakers, Maple Ridge will still return a strong core of the 2014 team that went to the WLA final. Maple Ridge will certainly benefit from the NLL season goaltender Frank Scigliano had with the Calgary Roughnecks, as he took over the starters role from Mike Poulin, going 6-6 with a 11.12 goals against average. Scigliano is quickly becoming one of the top young goaltenders in the NLL, and has the ability to steal a game, which the Burrards may need in a potential playoff series against the potent Victoria Shamrocks. Offensively the Burrards will be led by Ben McIntosh, who should be named NLL rookie of the year this season, after posting 86 points in 18 games. The right side of Maple Ridge’s offense looks to be their strength as Jarrett Davis, McIntosh, Mike Mallory and Ontario pick up Coady Adamson all possess elite offensive ability. The intelligence of Riley Loewen on the left side along with rookie Connor Goodwin, and veteran Andrew Murphy should provide the Burrards with sound offensive balance. Defensively the Burrads are an underrated bunch. A physical, tenacious defense the Burrads boast a ton of highly skilled “under the radar” defenders such as Zack & Colton Porter, Creighton Reid and Tyler Codron. The grit and physicality of Daniel Amesbury and Travis Irving should also play a factor. A slow start to the season was probable with some key Burrards toiling with the Edmonton Rush of the NLL. 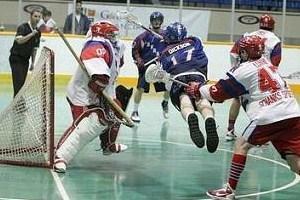 The Salmonbellies narrowly slipped into the 2014 WLA playoffs, snagging the fourth an final seed with an 9-9 record. However the Bellies where disposed of in four straight games by the eventual champion Shamrocks. This season the Bellies should be in contention for the league title, as they boast a very young and skilled line up with just enough veteran talent to keep the balance. In goal the duo of youngsters Alex Buque and Eric Penny has the ability to be the best tandem in the league this season, and early evidence of their combined 4-0 record, shows just that. Buque and Penny both had their coming out parties in the NLL this season, and should allow the momentum a strong rookie season in the NLL to keep them rolling throughout the WLA season. Offensively Logan Schuss will lead the bunch, with a full commitment to the Bellies this season Schuss should put up some huge numbers this season. Youngsters Keegan Ball and Colton Clark both return this season and should be steady contributors to the offense. The addition of Shane MacDonald from the OLA’s Brampton Excelsiors should also help the Bellies up front, while veteran Jordan McBride has made his presence felt offensively early on this season. Defensively New West is young, athletic and physical, but are still led by veterans Curtis Hodgson, Ian Hawksbee and Kyle Ross. The combination of athletic young defenders with the veteran leaders should allow the Salmonbellies back end to thrive this season. Look for Ontario import Patrick Miles to have a big impact both at the defensive end an in transition, as Miles looked strong with the Minnesota Swarm after he was added the active roster toward the end of the season. The Bellies have built a young an exciting lineup here in 2015, with every intention on getting back to Mann Cup for the first time since 2010. Langley missed the playoffs last season after capturing the regular season crown in 2013, and representing the WLA in both the 2012 and 2011 Mann Cups. Langley has rebuilt their roster in 2015, after losing a good chunk of their roster in 2014. The Thunder look to have an impressive offense this season, as they’ve brought Pat Saunders back to the fold this season, as he had spent the past few seasons in the MSL with a series of teams. Saunders had a breakout season this year with New England, and looks poised to carry the Thunder offense along side Joel McCready and veterans Lewis Ratcliff and Athan Iannucci. The addition of high scoring New West junior star Anthony Malcolm will only add to Langley’s offense depth, as will emergence of Tyler Melynk this season with the Edmonton Rush. Defensively the Thunder have the ability to be very strong with the likes of Nik Bilic, Brett Mydske, Kyle Belton, Ian Poole and Matt Leveque. Belton should shine in transition this season, as he’ll likely see his fair share of time at the offensive end of the floor. In goal the towering Brodie MacDonald will again be the Thunder starter. MacDonald was moved to Minnesota this season as he was expected to take over the starters role. However he ended up splitting time with fellow youngster Zack Higgins. You can expect MacDonald to have a big season this year as he looks to bring his game up a level after a sub par NLL season. The Lakers are right in the conversation with the likes of Langley and Nanaimo, the three teams should battle all season for the final playoff spot in the WLA this year, however the Lakers lack one thing the other teams have, and that’s goaltending. While Joe Bell and Mike Lowe provide quality defense, they’re not in that elite category, and that’s something that I believe will hurt the Lakers down the run. If there is a positive however, the Lakers should be able to fill the net with regularity, as the boast a ton off offense talent, with Tyler Digby and Dane Stevens leading the way. If or when Robert Church returns the Lakers line up will only get more potent as Church put up a ridiculous 92 points this season with the Edmonton Rush. Jason Jones, Casey Jackson and Scott Jones provide excellent depth, while I’m still waiting for Jackson Decker to break out offensively. Defensively two veterans lead the bunch in Peter McFetridge and Chris O’Dougherty, while Mike Brascia and Peyton Lupul will also be key contributors. The Lakers have a ton of offense talent, but the defense is some what thin in comparison to the top teams and the goaltending just isn’t where it needs to be for the Lakers to truly contend with the top teams this season. A once proud franchise, that was able to attract top names like Colin Doyle, Kim Squire, Curt Malawksy, Dan Stroup, Glen Clark, Pat Merrill, Ken Montour and Dallas Eliuk on route to their 2002 Mann Cup Championship, the 2015 version of the Coquitlam Adanacs has fallen on tough times, as they no longer are able to attract the big name talent. A rebuild was thought to be well underway with the drafting of Wesley Berg, the acquisition of Brandon Bull, Corey Shires coming in through the draft, Brandon Anger and Kyle Dobbie coming in from Ontario. But know, as we sit now Bull has done little for the Adanacs, Berg has gone east to the Oakville Rock, and while Shires, Anger and Dobbie have picked up points offensively, there not the big guns they Adanacs need to be competitive offensively. Ryan Johnson is now the Adanacs offensive leader, and has looked good early on with 8 points in 3 games. Veterans Bruce Murray and Steve McKinlay will lead the defense with youngsters Travis Cornwall and Sam Goodman also being looked upon to step up defensively. In goal Dan Lewis will lead the way, while Josh Phillips will be the support behind him. Lewis has had some impressive showings throughout his WLA and has some NLL experience under his belt. He’ll be in tough to put up big numbers this season with a thin roster in front of him, however he will allow the Adanacs to stay in games this season.